What Else Can I Expect From an Online Associate in Education Program? 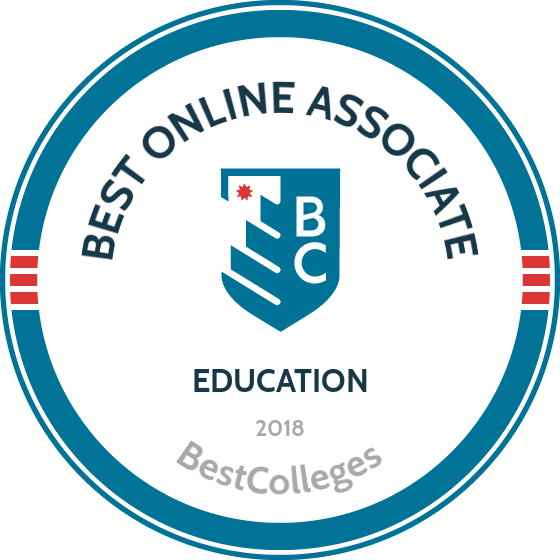 What Are The Best Online Associate in Education Programs? What Else Can I Expect From an Online Associate in Education Degree? It's no secret that an associate degree is a great first step toward earning a bachelor's. Many schools now encourage a “two and two” approach to undergraduate education, where students complete their first two years at a community college and finish their bachelor's at a four-year university. This allows students to graduate at a fraction of the cost of a traditional university. An online associate degree in education opens yet another door -- with this degree graduates can move directly into a paraeducator position. Many preschools and elementary classrooms need entry-level educators, and an associate degree offers terrific preparation. Not only do graduates gain immediate teaching experience, they're prepared to return to school with a solid foundation. Paraeducators are also eligible to join professional organizations like the National Education Association and begin the licensure process, all while taking the first step in a long, rewarding career. As labor studies have shown, it's a good time earn an associate degree and enter paraeducation. According to a recent study reported by Rasmussen College, you increase the number of jobs available to you by 134% simply by earning an associate. Paraeducation, in particular, is expected to grow by at least 6% in the next decade, according to the Bureau of Labor Statistics. Full-time students can usually complete an associate-level education online degree in two years or less. To graduate, most online colleges require students to complete 60 credit hours of coursework. $6,000 is the average cost for a year's tuitio. The Council for the Accreditation of Educator Preparation is the standard bearer for educational accreditation. Some programs lead to basic licensure. Many include a field practicum, which requires a background check. Liberty University has offered distance education options since 1985 and currently has a large virtual campus. The conservative, Christian institution has more than 250 online degree programs that are hosted by its main campus in Lynchville, Virginia. One such program is its associate of arts in education. This degree’s 60-credit curriculum provides students with a solid understanding of educational behavior and the theories and methodologies used in private, public, and Christian classrooms. Coursework reflects Liberty’s Christ-centered traditions, and students must take a minimum of 12 credits in classes that are dedicated to Christian life and thought. Participants must maintain a 2.0 GPA as they work their way through each eight-week session. Classes are taught asynchronously, and students typically earn their degree in two years. The university also has a generous transfer program, allowing as many as 45 credits to be transferred into the program as long as the final 15 hours are taken at Liberty. This degree has no practicum requirements. Not to be confused with Three Rivers Community College in Norwich, Connecticut, Three Rivers College is a community college located in southeast Missouri. Based in the community of Poplar, this two-year institution offers four degrees to distance learners, including an online associate degree in education. This program produces well-rounded students and teaches them the skills and knowledge needed to enter the workforce or transfer to a four-year university. The curriculum of the associate of arts in general education is made up of 66 credits, and students take about 16 credits per semester in order to finish the program in two years. Coursework includes required introductory classes in math, English, science, and history. Program participants also choose from a range of electives, in subjects like math for elementary teachers or education for the exceptional learner, in order to tailor their degree and pursue their teaching goals. Most classes are taught asynchronously for maximum flexibility. Three Rivers is an open-admission school and has transfer agreements in place with many Missouri universities. Based in Woodlands, Texas, Lone Star College System designed its associate of arts in teaching degree to replace the first two years of a traditional bachelor’s program. The 60-credit curriculum provides a solid platform from which to pursue a four-year degree. This program is based in the liberal arts and features an introduction to the teaching profession, as well as classes that discuss child development and working with special populations. The online associate degree in education at Lone Star is best-suited for students interested in pursuing a baccalaureate degree in the humanities (and not any STEM disciplines). Most coursework is taught asynchronously. Lone Star has articulation agreements in place with most colleges and universities in Texas, making it relatively easy to transfer credits to a four-year institution. Concord, New Hampshire’s Granite State College is a leader in web-based education, with more than 75% of the college’s 4,100 students taking at least one of their classes online. The small school offers an array of digital degree programs, including an associate of arts in general studies with an education concentration. The curriculum in this program provides students with a foundation for a four-year degree. It also readies prospective teachers for the state of New Hampshire’s paraeducator certification program. Five classes form the core of the degree: the writing process, critical inquiry, math, foundations of education, and instructional methods. Classwork is delivered asynchronously, but students do have to make campus visits to Granite State for some courses. GSC has an open-admission policy and rolling enrollment, enabling students to begin the program at the beginning of any term. Transfer credits may be accepted, but a minimum of 16 credits must be taken through GSC. Most students are able to earn their degree within two years. Founded in 1946, Hagerstown Community College was the first community college in the state of Maryland. The school remains a state leader, offering more than 240 web-based courses, including an online associate of science in education. This program’s 60-credit curriculum is ideal for prospective teachers who want to work at the elementary and secondary levels and features options in special education and early childhood education. The primary objective of this associate degree is to prepare students to succeed in a four-year teaching program. Students enrolled in Hagerstown’s online associate degree in education program must complete at least 31 credits of the school’s general requirements as well as 15 credits of education-related curriculum. Classes are delivered asynchronously using the Moodle learning management system. Program participants must also submit a professional portfolio to the education department in order to graduate. Most students complete their studies in two years, and Hagerstown is an open-admission school. One of the largest community colleges in Texas, Tyler Junior College has been around for almost a century. Today, the school is an online leader in the Lone Star State and offers dozens of web-based degree programs. TJC’s associate of arts in teaching was specifically designed to ready junior college students to pursue a bachelor’s degree and obtain teacher certification in Texas. Program participants can focus their studies in a specialty area, including early childhood education, middle schools, and special education classrooms. The curriculum at TJC is comprised of 60 credits spread across two years of study. There are 44 credits of core coursework and 16 credits of education-related classes. Most courses are taught asynchronously, and the entire degree can be earned online; however, a field practicum, which puts students in classrooms to gain hands-on experience, is required. Applicants must have a high school diploma or the equivalent and pass a criminal background check. Panola College offers an associate of arts in teaching degree that can be used as a stepping stone towards a baccalaureate degree and eventual teacher certification. The two-year program also meets the standards for paraprofessional positions in Texas classrooms. Students can select from three tracks: early childhood to sixth grade, sixth to 12th grade, and special education. The 60-credit program is divided into two sections: a 44-credit core curriculum and 16-credits of in-major coursework. The core provides a liberal arts foundation, including classes in math, English, communication, the sciences, history, and the visual arts. Alternatively, the education component is built around electives, making it easy for students to customize their degree and pursue an area of interest. A field practicum is mandatory but does not have to be done near Panola’s campus in Carthage, Texas. Students can find an approved practicum location near their home. Distance learners must also complete at least two proctored exams. Lehigh Carbon Community College’s associate of arts in education program was established to prepare graduates for work in grades four through 12 and lays the groundwork for a bachelor’s degree in teaching. The program focuses on childhood development, best educational practices, collaboration, and lesson planning. Field experience is also required to graduate. The entire degree can be earned online; visiting the college’s campus in Schnecksville, Pennsylvania is not necessary. Students must complete at least 60 credits and construct a credential portfolio of their work to earn their diploma. Classes are conducted asynchronously and offered in 10- and 15-week sessions during the fall and spring. Intense, five-week terms are also available during the summer. Most students graduate within two years. Online learners have access to the same admissions, counseling, library, and bookstore services as on-campus students. Distance learners are also encouraged to join the Teacher Education Student Association. A Christian institution in Waxahachie, Texas, Southwestern Assemblies of God University takes its religious traditions very seriously; every one of its student must enroll in a biblical studies course each semester. The school’s associate of arts in education is built around a core of four courses, which include foundations of education, psychology of education, instructional technology, and child development. The 60-credit curriculum is divided into five parts: the four major classes, general education (14 credits), social/behavioral sciences (12 credits), natural sciences and mathematics (seven credits), and biblical studies (12 credits). The degree can be earned completely online and courses are delivered asynchronously. Admission requires a high school diploma or the equivalent with a minimum 2.0 GPA. Distance learners can also “test drive” a course online before enrolling and receive a 15% tuition reduction compared to their on campus-peers. Fayetteville Technical Community College, in North Carolina, offers an online associate of arts in school-age education program. Graduates of this program receive both their degree and an instructional leader certificate, which makes it easier to find work as a paraeducator. The five-semester program is intended for distance learners who want to teach in elementary and middle grades. Students are familiarized with educational theory and receive hands-on experience in the classroom under the guidance of qualified teachers. This associate degree in education follows a 66-credit curriculum that emphasizes child development, instructional technology, and the foundations of education. It can be earned entirely online, and coursework is hosted by the Blackboard learning management system. Fayetteville has an open-admission policy but incoming students must take the North Carolina diagnostic assessment and placement test. Applicants must also undergo a background check and have a physical before undertaking field work with children. Campbell University was a pioneer in online education and has offered web-based classes since 1999. Today, the Christian institution in Buies Creek, North Carolina hosts more fully-online degree programs through its virtual campus than any other private school in the state. These offerings include an associate of arts in general education that can be tailored to prepare students for a career in teaching. The 62-credit curriculum at Campbell is based in the liberal arts, and core courses comprise about half of the required credits. Students must attend campus to complete a one-credit seminar course designed to assist incoming freshmen, but the remainder of classes can be pursued remotely. Classes are taught asynchronously, and students must maintain a 2.0 GPA to graduate. Most distance learners earn their degree in two years. Coursework is scheduled in accelerated, eight-week sessions. Laramie County Community College’s associate degree in education emphasizes the importance of a field practicum; classroom pre-service allows students to gain the knowledge and skills needed to succeed as a teacher. This 61-credit program is aimed at prospective educators who are interested in working in elementary and secondary schools, and it is designed to align with the University of Wyoming’s bachelor’s in education program. Students enrolled in the associate of arts in education program typically take 15 credits (five classes) each semester and graduate in two years. All coursework can be taken online. The public school practicum is generally scheduled during a student’s final semester, and participants must do a background check and have a 2.5 GPA to be eligible. Some distance learners add a secondary major to broaden their appeal to baccalaureate programs. Laramie participates in the Western Undergraduate Exchange, which offers reduced tuition to residents of western states. Lincoln Trail College, located in Robinson, Illinois, offers an associate degree in general studies that may appeal to students who want to become teachers. This degree can be completed entirely online, except for one public speaking course that is optional. Students are required to finish 64 credits to earn their diplomas. 20 of these credits are general education requirements, 12 are in an area of concentration, and the remaining 32 are electives. This large amount of self-chosen coursework allows students to customize their degrees, making this online program a good initial step towards earning a bachelor’s degree in education. The core requirements are nearly identical to those of many two-year education programs. Seven different concentrations are available, including communication skills, math, science, humanities, social science, business, and technology. Most classes are taught asynchronously and follow a traditional semester schedule. Program participants typically complete their studies within two years. Based in Dublin, North Carolina, Bladen is a two-year school with a well-established digital campus. It offers several degrees that can be earned entirely online, including a customizable associate in general studies that provides a good beginning for a teaching career. The program requires students to complete 63 credits. Only 18 of these are core requirements, providing distance learners with a lot of flexibility when it comes to designing a degree that fits with their career goals. Dozens of courses in education and teaching – including child development, educational tech, and curriculum planning – as well as classes in math, science, English, and history are available. Courses at Bladen are scheduled in eight-week sessions throughout the year, and most students earn their diplomas in two years. Online work is delivered asynchronously through the Moodle learning management system. Admission is open to high school graduates or prospective students with a GED. New students at BCC are required to undergo placement testing. Arizona Western College offers two programs that are suitable for aspiring teachers: an associate of science in general education and an associate of arts in general education. Both general studies tracks provide the basic elements of a teaching degree, and students can take a variety of education courses as electives to focus on an area of interest. Coursework for these education degree tracks can be earned mostly online, but students may be required to complete occasional residencies at the Yuma-based campus to fulfill requisites that cannot be earned at a distance. These general education programs are designed to provide students with a transferable degree, preparing learners for the next step towards a four-year program. Online courses are generally delivered asynchronously. Applicants should have a high school diploma, and students must take the Accuplacer exam, ACT, or SAT. National University is one of the country’s largest purveyors of online education. It offers an associate of arts in general studies that is well-suited for distance learners who want to become teachers. This web-based program emphasizes liberal arts and teaches students about a wide range of topics, including communication, science, mathematics, the humanities, social science, and diversity. Students also develop critical thinking, public speaking, decision making, and problem-solving skills, preparing them to transfer elsewhere and earn a baccalaureate teaching degree. NU’s online coursework is available in an interactive online environment 24/7. The university has a rolling enrollment system, allowing students to begin classes at their convenience. Applicants should have a high school diploma or the equivalent with a minimum 2.0 GPA, and students must take the Accuplacer assessment exam. Arkansas Northeastern College has two options for students who are interested in an online associate degree in education. The Blytheville community college offers two-year degrees in both elementary (K-6) and mid-level education. Both are transfer programs, preparing students to pursue a bachelor’s in education, and both provide a liberal arts foundation from which students can concentrate in an area of interest. Specialty areas include English, math, science, and social studies. Distance learners must complete a minimum of 62 credits to graduate. Coursework is delivered asynchronously and follows a traditional semester schedule with an eight-week intensive term in the summer. At least one proctored exam is required for each class; arrangements for these can be made with an advisor. As many as 30 credits can be awarded through the College Level Examination Program. Students must also take an online orientation before they can enroll in web-based courses. Navarro College’s eLearning campus offers an associate of arts in teaching that awards a degree in education. Participants can select from a high school track or one that encompasses early childhood to sixth grade, middle school, and secondary education. This is a transfer degree program that builds the skills and credentials needed to go on and earn a bachelor’s in education and teacher certification. Most of the curriculum is offered online, but students may need to visit the school’s main campus in Corsicana, Texas for some courses. Most students in this program take five classes (14 or 15 credits) each semester for four terms. All students planning on teaching in the Lone Star State must also pass the Texas Higher Education Assessment test before they can move into a four-year program. The base tuition for online classes is the same as it is for on-campus courses. Asheville-Buncombe Technical Community College offers an online associate in arts degree. Through the program’s 31 core credits, distance learners gain competence in reading, writing, oral communication, fundamental mathematical skills, and basic computer use. Students also work with an advisor to select 29 elective credits to finish their degree requirements and concentrate on areas that are relevant to their career goals. Program participants must maintain a 2.0 GPA or better to ensure that their credits will transfer to a four-year program. AB Tech uses the Moodle learning management system to deliver its online programming, and most courses are taught asynchronously. Distance learners are required to take an orientation course to familiarize themselves with the school’s web-based campus and procedures. Tuition rates are the same for online and on-campus students. Southern Arkansas University Tech has been awarding associate degrees to teachers for more than 15 years. The school’s online associate of science in education is designed to be a preparatory program for students planning on transferring to a four-year college. Distance learners can earn this degree entirely online. The 60- to 63-credit curriculum is divided roughly in half between general education and major requirements. Most students earn their degrees in two years. Three elective tracks are available: elementary education, middle grades, and math/science. A field practicum is required, and students are prepared to take the PRAXIS exam, which they will eventually need to pass as they move toward licensure. SAU Tech also offers an associate of professional studies in paraprofessional education, which may appeal to some prospective teachers. Applicants must have a high school diploma or the equivalent. Most people entering the workforce with an online associate degree in education do so as entry-level classroom help. This might be as an assistant teacher, an educational technician, or a preschool teacher who instructs children before they go into kindergarten. Some may find work in childcare centers, Head Start programs, or even in religious organizations. Almost universally, these positions require you to be comfortable around very young children, and part-time positions are not uncommon. Preschool teachers work in nursery schools and childcare centers, teaching language skills, math, and science to kids under five years old. The job requires patience and an ability to connect with and inspire toddlers. Because of large average classroom sizes, most teachers have help. Assistant teachers provide support to educators and work under the supervision of classroom teachers. They spend one-on-one time with kids, help them understand the instructions and lessons of the day, and provide personal attention. They also may work with special needs children. The position usually follows a traditional school schedule. Many families and child-care centers hire help to take care of young children while parents are working. Because this position often includes teaching kids rudimentary skills, an associate in education is a major asset. While an online associate in education offers good preparation for assistant teachers, it is also a great step to a bachelor's degree in education. Every state requires teachers to possess a four-year degree to gain licensure, and a two-year program lays the foundation. Most schools design their associate in education for students to transfer to a traditional university for the remaining two years of a baccalaureate degree. In other words, two-year schools provide an affordable path to complete general education requirements, and many schools guarantee that earned credits will transfer. The investment is worth it -- according to the Bureau of Labor Statistics, the median income of kindergarten and elementary school teachers was $55,490 in 2016, almost double the salary of a preschool teacher with only an associate. Bachelor's in Education: The traditional bachelor's in education takes four to five years to complete, and leads to licensure as a teacher at the K-12 level. Most programs allow students to specialize in the grade level or subject matter they'd like to teach. Bachelor's in Special Education: Special education teachers take a slightly different path to traditional teaching, earning extra certification in subject matters and techniques used in special needs populations. Bachelor's in Educational Administration: Most principals and school administrators have master's degrees, but a bachelor's in educational administration lays the foundation. This degree can usually be earned in four years, but some programs require slightly longer study. Education is one of the major factors determining financial success, and this is certainly true of an associate degree. According to recent labor market studies not only does a two-year degree improve one's job prospects -- 6.3 million available jobs, as opposed to 4.7 million for high school grads -- it also results in higher pay. Those with an associate degree earn nearly $23,000 a year, according to Payscale -- which amounts to an additional $6,000 a year over those with only a high-school diploma. A completed associate degree also makes you more attractive to employers and university admissions officers. One of the benefits of working in education is the array of professional organizations and networking opportunities available to you. These groups often have continuing education programs, special publications to keep you up-to-date on the industry, conferences to meet-and-greet peers and learn best practices, online discussion groups, and plenty of opportunities to meet like-minded people across the country. The NEA is the biggest and most important teacher organization among public schools, and has many resources for paraeducational professionals. A leading advocacy organization for high-quality early childhood education, the NAEYC sponsors conferences, many publications, and hosts an array of professional development opportunities. Head Start is a national program that provides support and resources to underprivileged or vulnerable children. The NHSA is the nonprofit organization offering a wealth of information to teachers of young kids. One of the main benefits of an online associate degree in education is its affordability. It is perhaps the least expensive way to begin a teaching career, as it provides a cheap alternative to pricey four-year schools. Even so, tuition costs may still be expensive. Thankfully, students in online associate in education programs are eligible for the same financial aid as their on-campus counterparts. Complete the Free Application for Federal Student Aid to determine your eligibility for federal funding. Several organizations also offer scholarships to aspiring teachers, and Teach.org is an excellent source of funding opportunities. Some communities will even offer grants or pay off your loans in exchange for a commitment to teach in specific communities.